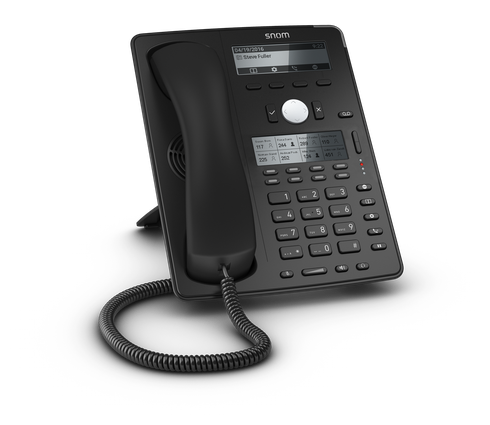 Aesthetically appealing and highly practical, the D745 desk phone is a prime solution for those who utilize the telephone in daily work. It is not only easy to use, but also cost effective for large-scale deployment. Its elegant design complements even the most prestigious surroundings, and its high/low angle foot stand allows for maximum user comfort and efficiency. Wideband HD audio ensures crystal clear sound quality, and features such as call management, customizable call lists and address book are provided on a high-resolution graphical display. A second screen supports four virtual pages, offering a total of 32 programmable keys with multicolored LEDs. The D745 includes a high-speed USB port to connect accessories such as headsets or WiFi sticks, and a gigabit Ethernet switch for connecting LAN or VPN clients to provide an additional layer of security.